Every year, organisations have the misfortune of being taken to an employment tribunal, often finding they must pay out compensation - not because their decision was correct, but because the steps they followed in reaching that decision were either missed or wrong. Disciplinary and grievance procedures are frameworks that provide structure for managing difficulties, which may arise at work, from either the employees or employers perspective. 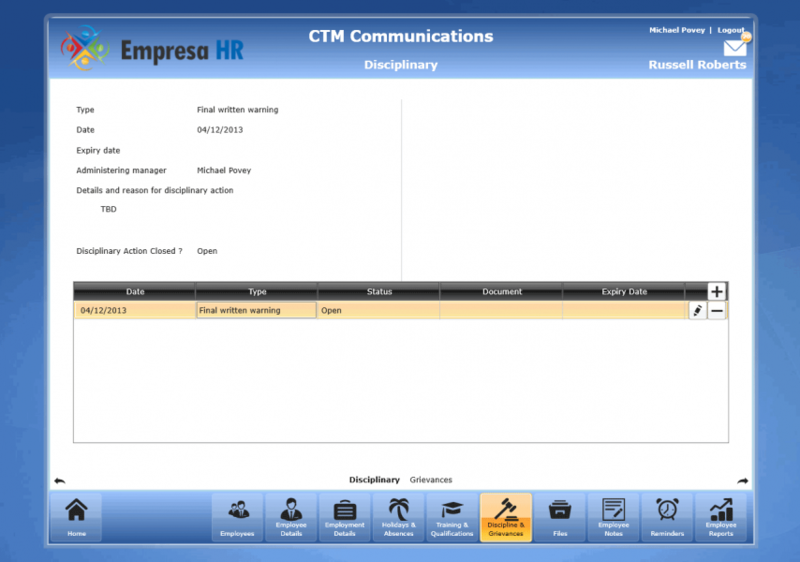 Empresa HR software helps to record disciplinary and grievance issues. The software includes grievances and disciplinary letter templates. Set notifications to ensure actions are performed within the required time frame. Save any supporting documentation with the record and view it from within each action. Assign specific managers to each case. Every stage of the disciplinary and grievance processes are tracked through Empresa, which will generate reminders for HR managers when required.